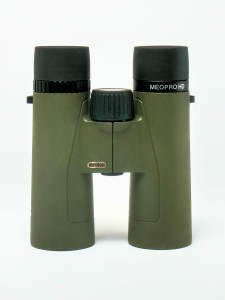 Meopta is an optics manufacturer that is not well known to U.S. birders. This is a shame since Meopta makes excellent quality optics at generally reasonable prices. That is certainly the case with the 8x42 HD MeoPros. The MAP (Minimum Advertized Price) for it is just $479.95. That broaches several topics at once: optical quality and cost. Optical quality will be discussed in detail below, but a quick digression about pricing is in order. We think of optics pricing in terms three tiers: low, middle and high. Anything below about $350 is low priced; from $350 to $1000 is mid priced, and anything over $1000 is high priced. Optics is a market where pricing tends to run true, excluding the occasional short-lived deal. Generally speaking, you get what you pay for, and more to the point, you don't get what you don't pay for. Convincing you that you're getting more than you actually are is called "marketing"! Back to the binoculars in hand, the MeoPros fall at the lower end of the mid-price range. One other note: we received only the 8x42 model for testing, so this article concerns only that configuration. Optical performance is the single most important category for a binocular. On the whole, we were quite favorably impressed with the 8x42 MeoPros in the field. One of the things that just jumped out at us was how effective their fluoride HD glass and lens coatings were in eliminating chromatic aberration ("color fringing") – basically, you see none whatsoever under virtually any field conditions. Their performance in this regard is fairly extraordinary. 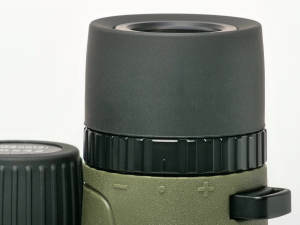 We see a lot of binoculars with much more expensive glass and coatings that don't perform nearly as well in eliminating chromatic aberration. Meopta's HD glass also yields consistently bright, crisp, high-quality views under virtually all field conditions. We measured the minimum close focus on these binoculars at just 49-50 inches (1.26 m) without notable field collapse (blacking out on either side of the visual field), which is very impressive indeed. While we're talking about focus, it's worth noting that the 8x42 MeoPros go from minimum close focus to infinity in about 1.3 turns of the focus knob. This is about the perfect level of pitch: fast enough that you can react to moving targets, but not so fast that you blow past your intended focus point. The mechanism is a bit stiff, but nicely precise. Eye relief was a healthy 20 mm, which should be more than sufficient for most users. Interestingly, Meopta's website lists two different field of view statistics for this binocular: under Specifications, it lists the field of view at 377 feet at 1000 yards, but in the text description of the product, the same statistic is listed at 384 feet at 1000 yards. We aren't completely sure what to make of this! Both estimates are a little bit better than average performance for an 8x binocular with regard to this property, so it probably doesn't matter much. 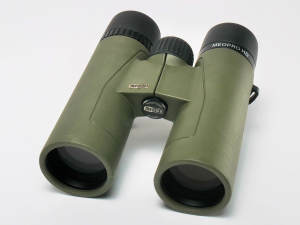 The 8x42 HD MeoPro binoculars are very lightweight at just 26.0 oz. (737 g) - note: this figure does not include the weight of the strap or ocular and objective lens covers, but they don't actually add much. This binocular measures 6.6 inches long (15.9 mm) with eye cups retracted and 6.9 inches long (17.3 mm) with the eye cups fully extended. With the hinge fully open, they are exactly 5 inches (12.6 mm) wide at the objective end. The interpupilary distance range on these is quite broad at 56-75 mm (2.5 - 3.0 inches). This means that these binoculars should easily fit the breadth of most people's faces. As long as we're talking about eye cups, a word or two about what the MeoPros do for these. The eye cups on these binoculars have one stable position between fully out and fully in and they adjust between positions with a helical twist. All three positions are very stable; they don't collapse inadvertently, which is very good. In this, the 8x42 MeoPros are well-designed. The only potential downside is, with only three positions (most binoculars have four or more positions) that if these three positions don't happen to provide you with optimal eye relief, you will have to make up for that in how you hold the binocular to your face. Fortunately, the MeoPros have above average eye relief, so they should fine for most people. As expected on any good quality roof prism binocular, the MeoPros are completely waterproof. They are sealed and nitrogen-filled in order to be internally fog proof. The diopter adjustment is a full ± 3 diopters, which is enough for anyone to find a comfortable sharp viewing position. The adjustment mechanism is a simple twist-ring on the right barrel of the binocular. It does not lock, but there is quite a bit of resistance in the mechanism, so it tends to stay where you put it. If your eyes require a setting other than the middle, we recommend marking that position in some way so that you can easily recover it if it's lost or changed inadvertently. The rubber armoring is dark olive green, and while not particularly soft or pliable, it has kind of a sandpaper texture to it that affords a good grip. Shallow thumb grooves on the barrels assist in this regard. The MeoPro 8x42 HD binoculars come with the usual assortment of accessories: a strap, a case, and covers for the ocular and objectives lenses. So, let's deal with those in turn. The strap is a hybrid of cordura, plastic, leather and foam rubber. The foam rubber portion is the section that goes around the neck. It is a little over an inch wide and nicely flexible without being so stretchy that the binocular bounces vertically. The cordura section of the strap attaches to very sturdy lugs on the barrels. 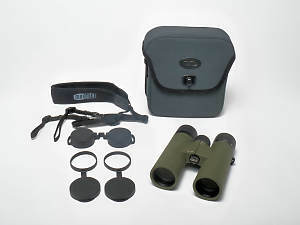 Conveniently, the strap detaches from the binocular by a pair of plastic pinch clips, which also can connect to identical clips on the sides of the case, allowing you to transfer the strap between the case and the binocular. The ocular lens cover is the usual piece of pliable black rubber, with the two cups united by a slender bridge region. There is a full bracket on the right side to thread the strap through and a gapped bracket on the left side, so that it can be detached and swung aside while in the field. That's all well and good. We initially had some issues with the case and the lens covers and the first draft of this paragraph was a bit different. We expressed those issues to Meopta at a recent meeting. Their response was "Oh. You must have an older binocular. You haven't seen the new case and covers." Apparently, they had experienced those issues themselves and had already fixed them. The new case is a little larger so the binocular can be inserted and removed more easily and no longer pulled off the objective covers, which were formerly too loose. The rainguard now fits more snugly. Clearly, while Meopta had made some initial errors with the accessories, they were responsive to fixing them. So, to sum it all up, where do we stand on this Meopta 8x42 HD binocular? Overall, we have to give it a thumbs up. The optical performance is very solid overall, and in some traits, like the lack of chromatic aberration, Meopta earns very high marks. And remember, this is a mid-priced optic. The series includes 8x32, 10x32, 8x42 and 10x42 models ranging in price from $429.95 to $499.99. Putting it in that context, the optical performance stands out, if anything, a bit more. The physical properties of the binocular measure up as well, and the peripherals are also executed well. So, if you are in the market for a binocular and your price limit falls in this range, the 8x42 HD Meopta might be a great choice for you.